The Z-agon project is operated by a collaborative team. Each semester, 4 students from diverse background form a new research team. The Z-agon project began with 4 undergraduate students at 2002 autumn. 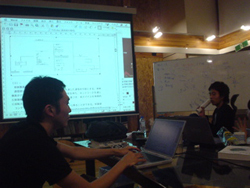 The team was formed under a research category of "Next Generation Moving Image". Since the project has started, 11 students in total have participated in. Some of them have already graduated from Keio, and now working at Japanese major TV and Ad companies. Now we have a graduate student and 3 undergraduates working on this project. but it is well managed to be an innovative atmosphere. other than design, computer science, management, and so on. See their bio for backgrounds of recent members.